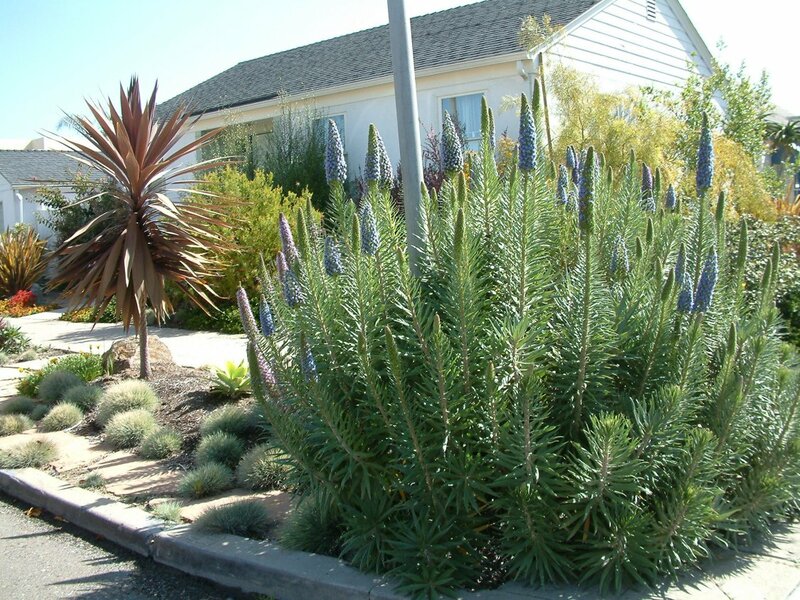 Mature specimens of this evergreen shrub can grow to a size of 6'-8' tall and 8'-10' wide. In the spring, spikes of blue-purple flowers appear above the gray green foliage. It should receive full sun in coastal areas. In warmer inland areas, it should get some afternoon shade and more water during summer. However, once it's established, it needs little or no summer watering. This plant can be severely damaged by frost below 25 degrees F. Prune during fall to encourage lower branches to bloom. Great shrub for hillsides where it can spread. Honey bees love this plant. Does great in poor, dry soil. All parts of plant are poisonous. Bauer's Dracaena grows to 10' high, and is topped with a 5' wide crown of evergreen burgundy leaves. In summer, there are clusters of fragrant white flowers. This perennial tends to get leggy so it should be underplanted with lower growing plants. It tolerates full to part sun, moist and well draining soil. When established, this plant has low water needs. It looks great in containers and near swimming pools. It tolerates coastal conditions. It does not tolerate frost so move indoors to protect it unless you live in a frost-free area.